Abstract: Overall bioturbation of sediments of the Culm facies is much lower compared to the Mesozoic and Cenozoic flysch facies. Totally reworked intervals (up to 1 cm thick) occur locally at the tops of turbiditic beds. Much more frequently, visual equivalents of a „mottled zone“ were observed at the two localities which represent a transitional facies between "laminites" and greywacke bodies. Approximately one-half of the turbidite beds studied show a mottled level. Planolites montanus Ichnofabric and Rhizocorallium Ichnofabric are infrequent. Most of the laminites show no ichnofabric except cross-sections of Dictyodora, which are typically observed on bedding planes only (not in vertical sections). Compared to the Mesozoic and Cenozoic flysch (i.e. Rhenodanubian or Carpathian flysches), the Culm facies appears to have formed in less oxygenated settings possibly with shorter and unequally distributed colonization windows. This explains the prevalence of traces with complex feeding strategies comprising chemosymbiosis and gardening (Chondrites, Dictyodora). Their effect on the integrity of sediment (i.e. the amount of transported material) was weak. 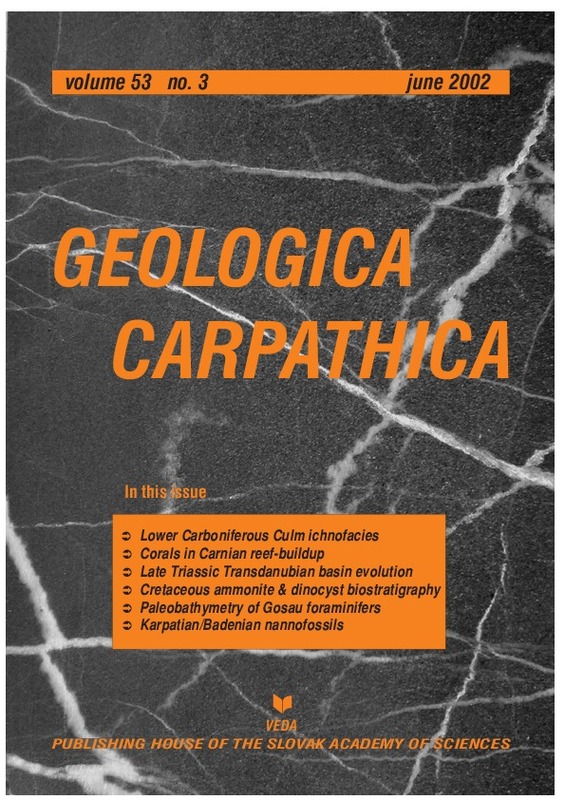 Abstract: Carnian small scleractinian coral fauna found in the Male Karpaty Mts (Western Carpathians), is closely related to early late Carnian corals of the Dolomites (Southern Alps). The former fauna includes three new genera: Carpathiphyllia (type species: C. regularis sp.n. ), Pontebbastraea (type: Stylophyllopsis pontebbanae Volz), Protostylophyllum (type: Stylophyllum praenuntians Volz), and a new species of Volzeia (V. carpathica sp.n.). The Carnian age of the upper part of the Veterlin platform sequence proves the continuous development of Triassic carbonate platform, which was never interrupted by the Lunz/Rheingraben clastic interval (unlike to the Choc- and/or Lunz Nappe sequences). Abstract: The setting and facies distribution of the Upper Triassic basin formations in the Transdanubian Range of Hungary clearly reflects the paleo-geodynamic evolution of the northwestern termination of the Neo-Tethys margin. Westward propagation of the Neo-Tethys continued during the Middle Triassic. By the Late Triassic large carbonate platforms (Dachstein-type platforms) developed on the continental margin of the newly formed oceanic branch. Progressive rifting led to downfaulting of the external (ocean-ward) margin of the platforms and formation of narrow intraplatform basins roughly parallel to the platform margin since the Carnian. Some of these basins were already filled up and reoccupied by carbonate platforms in the Triassic but some of them persisted until the Jurassic. Initiation of opening of the Ligurian-Penninic ocean-branch resulted in rifting and fomation of new extensional basins in the Late Norian. In this way a large basin-system came into being (Kössen Basin) behind the platforms, so that the previous continent-encroaching platform became an isolated platform. The basins were filled up with terrigenous clay and platform-derived carbonate mud by the Late Rhaetian, giving rise to progradation of the platforms onto the former basins. Coeval rifting of the Neo-Tethys and the Ligurian-Penninic branches led to disintegration and step-by-step drowning of the Dachstein platform system in the Early Jurassic. Although the evolution of the studied basins was mainly tectonically controlled, their architecture and depositional pattern were influenced by several other factors: climate, sea-level changes and the general paleogeographic setting. Abstract: The basinal, or Godula sequence of the Silesian Unit of the Outer Western Carpathians incorporated in the present nappe structure is characterized by a considerable thickness of Lower Cretaceous dark-grey, prevailingly pelitic deposits. Barremian and Lower Aptian ammonites occur in several isolated fossiliferous beds. Non-calcareous dinoflagellate associations were analysed in the same beds to provide a correlation of both ammonite and dinoflagellate ranges. Where index ammonites are missing, associations of dinocysts become a key stratigraphic element in thick lithologically monotonous deposits. The composition of dinocysts also supports environmental and paleoclimatic reconstructions in the area studied. Abstract: Paleoecological studies indicate environmental changes during selected time horizons within the Upper Cretaceous sediments from three localities of the Gosau Group in Austria. Foraminiferal assemblages were studied from the localities Grünbach-Neue Welt, Weissenbachalm and Spital am Pyhrn. Paleobathymetric changes have been reconstructed using plankton/benthos ratio, percentual abundances of selected genera ans species diversity. Three depth levels with three groups of dominating species were recognized from the Late Turonian to Early Santonian sediments of the Grabenbach Formation at Weissenbachalm locality. From the Grünbach-Neue Welt area the Grünbach Formation (Early Campanian) and Piesting Formation (Late Campanian-Early Maastrichtian) comprise transitional assemblages from shallow-water, neritic marls to bathyal hemipelagics and turbidites. The character of foraminiferal assemblages of the Weisswasser Formation indicates shallow-water shelf conditions during Late Santonian and Early Campanian. The deeper water Wurberg Formation contains richer foraminiferal assemblages with higher species diversity. Abstract: Calcareous nannofossils were studied in the Karpatian and Lower Badenian deposits of the Carpathian Foredeep, Moravia in view of their use in biostratigraphy. The following nannofossil horizons were recognized: 1. "helicolith" horizon with common Helicosphaera ampliaperta in sandy clays ("schlier") of the Laa Formation, 2. Helicosphaera waltrans horizon in clays and siliciclastic sediments of the Grund Formation and in the basal siliciclastic sediments of the Lower Badenian, and 3. Sphenolithus heteromorphus horizon in clays ("tegel") of Lower Badenian (Moravian) age. In its upper part, oval forms of Coronocyclus nitescens and 5-rayed symmetrical discoasters appear. The occurrence of species H. waltrans is limited to a short stratigraphic interval approximately corresponding to the range of planktonic foraminiferal species Globigerinoides bisphericus and includes the first appearances of Praeorbulina ssp. and Orbulina suturalis. The dominance of helicoliths in the Laa and Grund formations and in the basal siliciclastic sediments of the Lower Badenian gives evidence for a shallow epicontinental sea. Nannofossil enrichment above the Helicosphaera waltrans horizon evidences deepening of depositional area, open-sea conditions, and reflects the Lower Badenian transgression. The problem of correlation of the Central Paratethys regional stages either with the Mediterranean chronostratigraphic scale or with NN zones was discussed.